Are you familiar with the popular Mercy Me song, I Can Only Imagine? This is one that has been so inspirational and moving for many people. However, most of us do not know the story behind the song. And that is what this film is all about! unlimited potential—set Bart on a musical pathway. Chasing a dream while running from broken relationships with father and Shannon, his childhood sweetheart, Bart hits the road on an old, decrepit tour bus with his new band MercyMe—named for his grandmother’s favorite expression. With the guidance of a grizzled music-industry insider, the band begins a journey none of them could ever have imagined. 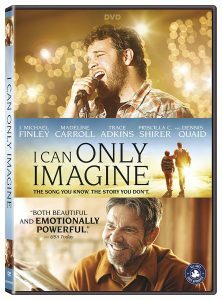 I CAN ONLY IMAGINE stars J. Michael Finley, Madeline Carroll, Trace Adkins, Priscilla C. Shirer, with Cloris Leachman and Dennis Quaid. The #1 Inspirational Movie of the Year Comes Home on Digital on June 5 and Blu-rayTM Combo Pack and DVD on June 12. As I said, this song moves me each time I hear it. So much power in the lyrics! I am a lover of stories and hearing more about how this song came to be is something I know I will enjoy. Then there is Dennis Quaid who I have adored as an actor for years. From a few exclusive scenes I was given the ability to preview, I can tell that this is a story of change and redemption. A story of how God can work in our lives for the better. Those that watch this film will learn how Bart finds a new path in life from that which he expected. How a teacher sees his talent for music and a voice meant to be shared and uses her position of authority to transition him from the expected football to the stage. And how what he thought the fledgling band Mercy Me should be doing and what they needed to share were different. Like many, there are times in my life which are dark and trying. Times when you wonder if joy and peace will ever return. However, I know that clinging to my faith and allowing God to work in His time means that joy and peace will come. It just won’t take the path I may envision or occur in the time frame that I may desire. My youngest son and I were able to see this in theaters. This is such a moving film and I am eager to watch it again on DVD in my home. I especially want to watch it with my husband. As I surmised from the trailer when it was released in theaters, this is a story of forgiveness and redemption. Bart lived through difficult situations when he was growing up. He became bitter towards his father and couldn’t wait to leave home. All through his struggles from when his mother left, he embraced a faith that continued to grow. He also found his voice and talent for music. But, as the story unfolds, you see that he HAS to return home to make things right. His manager can see the pain within him and knows it is only through letting go that Bart will be able to become successful in his career as a musician. Definitely, have some tissues on hand. There are moments where tears are quite likely to flow. 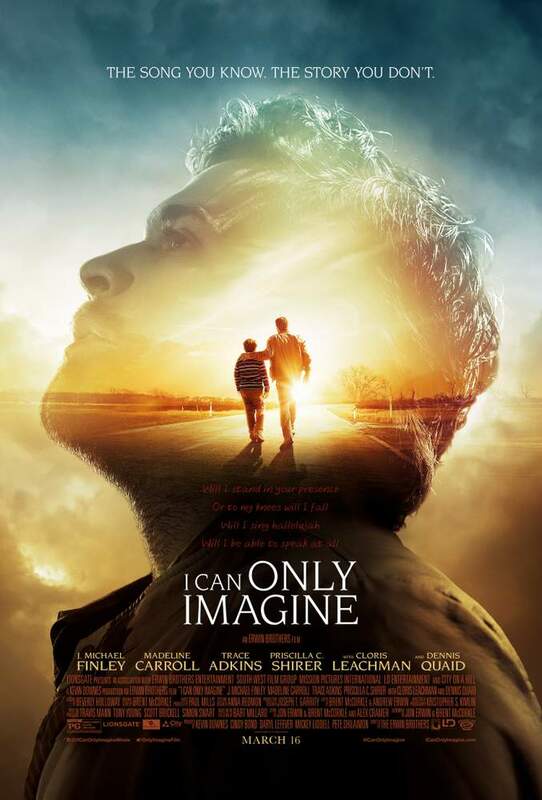 Have you seen I Can Only Imagine Yet? Have you felt a special connection to the song? What appeals to me is Dennis Quaid. I'm not familiar with the song. I adore Dennis Quaid as well. Just the trailer had me in tears! This looks like such a good movie! I love the song, and I think this is a movie I could get my husband to watch too! I know!!! I have to decide how many tissues to bring with me when I see it in theaters. I suspect there will be tears flowing. I have loved this song since it first came out. I am truly intrigued to see the movie and find out the why behind the song. I love MercyMe and would love to see the movie. It is such a powerful song! Wishing you luck on the giveaway so you can see the movie when it releases. I do love the song. I love Mercy Me. I have seen them twice in concert. I read most of the book from being on the launch team before it was released to the public and it is a great read. I really want to see this movie. I haven't seen the book, but need to check it out! How fun to have seen them in concert.